HUMAN ("Helping Unite Mankind And Nutrition") is America's leading distributor of convenient healthy foods, a concept we pioneered in the Healthy Vending Industry back in 2003. We're looking for top 10% entrepreneurs to join us in our mission to create "Easy Nutrition Everywhere" by owning their own successful, fun, and fulfilling health & nutrition franchise via healthy vending machines, healthy micro markets, and turnkey healthy food delivery to offices and homes. In short, we help entrepreneurs make money, help people, and have fun so they can achieve unlimited earning potential and consistent monthly cash flow. Is in over 2,000 schools, offices, hospitals, gyms and other locations in over 40 U.S. states, Canada, and Puerto Rico. 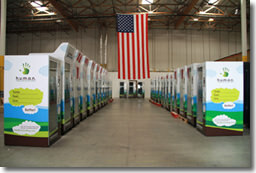 Is ranked by Inc. Magazine as the #168th Fastest Growing Private Company in America in the 2013 Inc. 500 list. 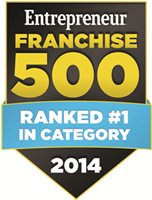 Is ranked by Entrepreneur Magazine as the #1 Vending Franchise in the 2014 Franchise 500. Donates 10% of profits to charities that fight the causes of childhood obesity and malnutrition. Obesity Crisis. Did you know that over 2/3 of adults and 1/3 of kids are overweight or obese? This crisis is costing our healthcare system over $150B annually. Massive Void. There are over 5 million vending machines in the U.S. and only 5000 of them offer 100% healthy vending items. Huge Demand. Look at the explosive growth of Whole Foods, Trader Joe's, and the entire healthy food industry. There's a huge demand for healthy products and the traditional vending industry has been ignoring it. Money. HUMAN is more than just a "vending" opportunity. HUMAN provides its franchisees with multiple revenue streams comprising Healthy Vending, Healthy Markets (micro markets), SnackNation turnkey healthy food delivery, and SuperHumanSnacks local distribution. Platform. 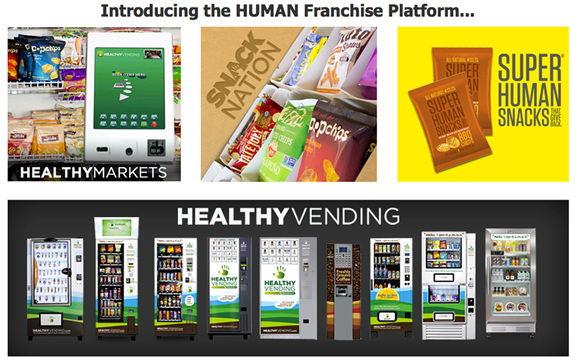 HUMAN offers 9 different healthy vending machines including the HUMAN Touch (46" touch screen vending machine), Healthy Markets (100% healthy micro markets), SnackNation (turnkey healthy snack delivery service for offices and homes), and SuperHumanSnacks (our proprietary product line). We don't subscribe to a one-size-fits-all mentality when it comes to automated retail and healthy food distribution. With HUMAN, you own a "healthy foods distribution platform," not a vending business. Family. Join a fun, passionate family of like-minded social entrepreneurs. 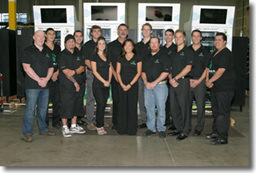 Our franchisees continually tell us this is a crucial part of our franchise system. If you can't have fun in business, it's usually not worth it! Support. The industry's most comprehensive and innovative marketing & support system including online training portals, lifetime coaching, and live video tech support in the field. To see what it's like being a HUMAN Franchisee and how you can get unlimited earning potential, enter your information below. 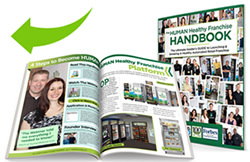 We'll send you a free copy of the HUMAN Franchise Handbook, which is the "2014 Ultimate Insider's Guide To Owning a Healthy Automated Retail Business." 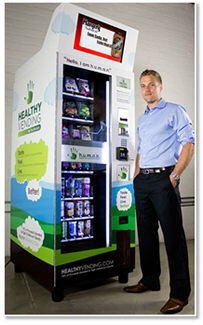 Healthy Vending by HUMAN is currently accepting inquiries from the following states: Wyoming, West Virginia, Wisconsin, Washington, Vermont, Virginia, Utah, Texas, Tennessee, South Dakota, South Carolina, Rhode Island, Pennsylvania, Oregon, Oklahoma, Ohio, New York, Nevada, New Mexico, New Jersey, New Hampshire, Nebraska, North Dakota, North Carolina, Montana, Mississippi, Missouri, Minnesota, Michigan, Maine, Maryland, Massachusetts, Louisiana, Kentucky, Kansas, Indiana, Illinois, Idaho, Iowa, Hawaii, Georgia, Florida, Delaware, Washington, D.C., Connecticut, Colorado, California, Arizona, Arkansas, Alabama, Alaska. Healthy Vending by HUMAN is also currently accepting inquiries from Canada and outside the U.S., but not from the European Union.